It was pouring rain this weekend but I am already thinking about Spring and all the fun projects to do. I wanted to make a simple, yet cute Easter card to send out to my friends and family. I started with Whisper White cardstock as my base and put So Saffron as the card front. 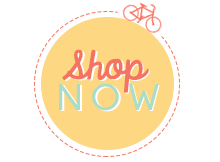 I used the Sizzix oval diecut and ran them through my Big Shot. I chose some fun patterned papers (3 different patterns) and ran them through all at once. I chopped off the bottom edges (not that you can see them) so that they looked more like eggs rather than ovals. I kept them tightly layered and sliced them into threes. Then I simply swapped the patterns around and glued them all down to the card. I took some celery cardstock and with scissors I cut the paper to look like grass and placed that at the bottom. 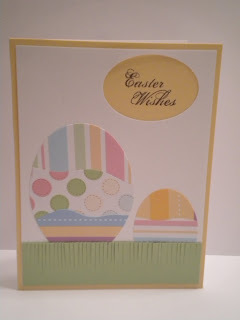 I took my large oval punch and punched thru the white cardstock and stamped “Easter Wishes” with chocolate chip ink. I think they turned out pretty cute and only took about 10 minutes to create. Ok on to my next Spring project!